Los Angeles, CA – After starting brewing in 2014 and operating an informal cross between a speakeasy and a warehouse over the last six months, DTLA’s BOOMTOWN BREWERY is upping its game significantly with the opening of a brand-new taproom adjacent to the brewery and current event space Super Bowl Weekend, February 2-5, with a ribbon cutting hosted by downtown’s Councilmember José Huizar (14th District) at 3:00PM Friday and the official Grand Opening set from Noon-1:00 AM Saturday, February 4th. 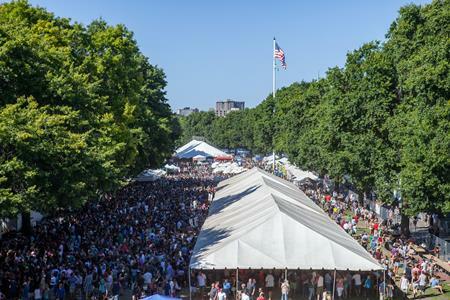 On the day, patrons will enjoy a full range of Boomtown beers alongside food trucks, an impressive DJ lineup; games to play with friends from ping-pong to foosball; giant chess to corn hole and darts, along with Floyd’s BarberBus and much more. At Boomtown, though, it’s all about the beer, and beer starts with water. General Partner and Brewmaster Samuel “Chewy” Chawinga explains that first, they work combining filtration and reverse osmosis to create water with as chemically neutral a flavor profile as possible (a mere 50 parts per million dissolved solids). Then, they carefully introduce minerals to duplicate the distinctive water recipe native to the area where the beer they’re brewing comes from – Bohemia for Pilsners, for example. Matched with their brewing techniques and the finest ingredients needed to make beer, this attention to water chemistry and detail gives Boomtown’s beers their authenticity and unmatched quality. 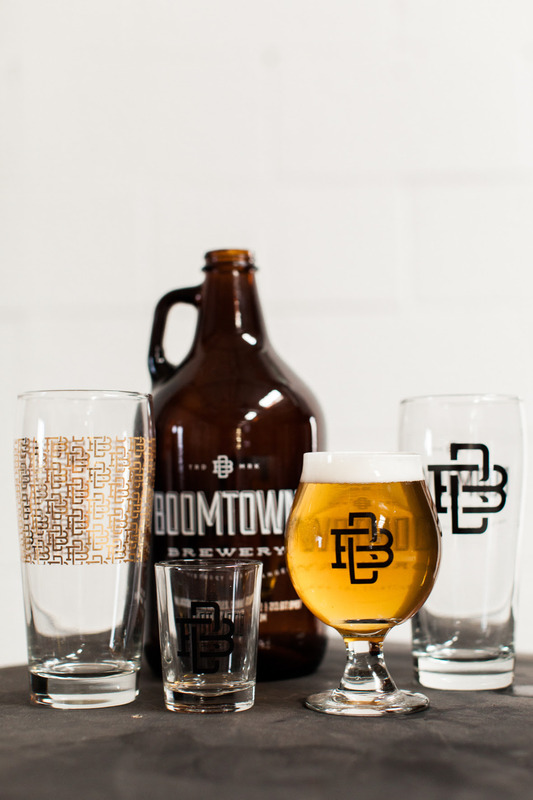 Starting February 3rd, Boomtown Brewery will initiate its members-only Golden Glass membership. In addition to a monogrammed glass stored on the premises, members can enjoy ten pints per month; first access to new releases; members-only special events; one free growler and growler fill per month; and surprise, spot growler fills as new beers are released. Membership is capped at 300 individuals, and the first 150 of those get 20% off ANY purchases they make over their allotment during the year. Only 75 charter Golden Glass memberships will be sold between now and February 15th at $325 each. What to eat at Boomtown Brewery? Sometimes it’s up to them; sometimes it’s up to the guests, who can bring any food they like into the event space. Boomtown has bar snacks and frequent scheduled and unscheduled visits by food trucks. The new taproom features large communal tables sealed with surfboard resin (themselves art objects that form a design when viewed from above, which few are likely to do), a long bar, and rough-hewed ash-wood walls. The cavernous event space, decorated in a homey, haphazard style including tuck and roll naugahyde chairs, sturdy mid-century couches, swap meet and garage sale acquisitions, area rugs, tables made from wood planks atop empty kegs, and a host of table games. An enormous wood sculpture of a heart adorns one corner. With large open spaces, outdoors and casual, comfortable industrial design, the brewery complex promises to become a special event mecca alongside a beer mecca. Boomtown will be rolling out an event schedule featuring regular DJ performances, art programming, and more. Off the premises, dozens of restaurants and bars in LA and environs carry Boomtown brews. Along with other downtown brewers Angel City Brewery; Arts District Brewing; Dry Rover Brewing; Indie Brewing; Iron Triangle Brewery; and Mumford Brewing, it’s one of seven members of the DTLA Brewers United (source: Beer Paper, January 2017). With 50 Brewers in the LA Brewer’s Guild, Downtown Los Angeles has emerged as the center of Los Angeles’ craft brewing culture, eclipsing the South Bay as the Los Angeles Times predicted in 2015. By contrast, however, San Diego County, the so-called “Craft Beer Capital of America (San Diego Magazine and others) boasts 100 breweries and brew pubs—so as go-go as Los Angeles is, there’s plenty of room for Boomtown to grow into in the area. Boomtown Brewery features a top-notch management and operations team among its four managing partners: Charles Lew owns Stout’s several locations in LA, Tennessee and Kentucky, Scotch gastropub The Morrison, and the Johnny Cash-inspired Rock & Roll lounge, The Gasser Lounge in Redondo Beach. Alex Kagianaris is partners with Lew in Stout and their boutique law firm, Kagianaris Lew LLP. Culinary Institute of America-educated John Rankin formerly served as manager of Laurel Hardware. “Chewy” served at the Hollywood Brewery before developing beers for Stout and other breweries before becoming Brewmaster at Boomtown.